^ "Intercontinental Ballistic Missiles". Special Weapons Primer. Federation of American Scientists. Retrieved 2012-12-14. 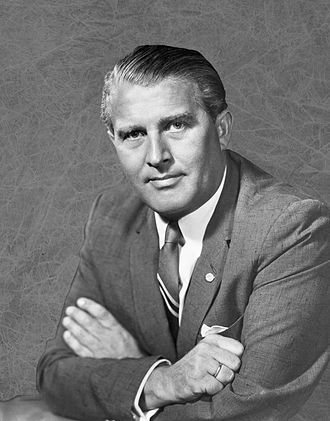 ^ Correll, John T. "World's most powerful ballistic missile". Retrieved 2018-02-22. ^ Wade, Mark. 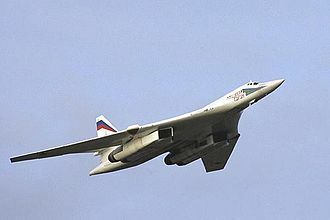 "R-7". Encyclopedia Astronautica. Retrieved 2011-07-04. ^ "Atlas". The Exploration of Space. Century of Flight. Retrieved 2012-12-14. ^ "Atlas D". Missile Threat. Archived from the original on 10 February 2012. Retrieved 2012-04-19. ^ "Atlas". Encyclopedia Astronautica. Astronautix. Retrieved 2012-04-19. 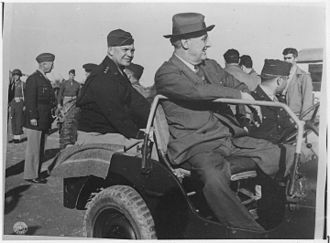 ^ "DF-5". Weapons of Mass Destruction / WMD Around the World. Federation of American Scientists. Retrieved 2012-12-14. ^ "Type 92 Xia". Weapons of Mass Destruction Around the World. Federation of American Scientists. Retrieved 2012-12-14. ^ a b Feickert, Andrew (5 March 2004). Missile Survey: Ballistic and Cruise Missiles of Foreign Countries (PDF). Congressional Research Service (Report). Library of Congress. RL30427. Retrieved 2010-06-21. ^ a b Pfeffer, Anshel (2 November 2011). "IDF test-fires ballistic missile in central Israel". 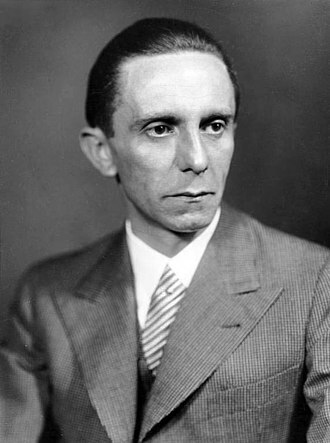 Haaretz. Reuters. Retrieved 2011-11-03. ^ a b Mallikarjun, Y; Subramanian, TS (19 April 2012). "Agni-V successfully test-fired". The Hindu. Retrieved 2012-04-19. ^ "North Korea's Taepodong and Unha Missiles". Programs. Federation of American Scientists. Retrieved 2012-04-19. ^ "North Korea says it successfully launched satellite into orbit". NBC News. 12 December 2012. Retrieved 2013-04-13. ^ "Israeli Arrow ABM System is Operational as War Butts Darken". Israel High-Tech & Investment Report. November 2002. Retrieved 2012-04-19. 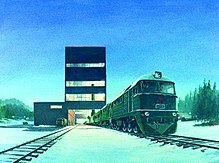 ^ "Fort Greely". Systems. Missile Threat. 8 December 1998. Archived from the original on 30 January 2012. Retrieved 2012-04-19. ^ "ICBM". Encyclopædia Britannica. Retrieved 2012-04-19. ^ India test launches Agni-V long-range missile, UK: BBC News, April 19, 2012, retrieved 2016-03-11 . ^ Edwards, Joshua S. (20 September 2005). "Peacekeeper missile mission ends during ceremony". US: Air force. Archived from the original on 2012-10-18. Retrieved 2016-04-28. ^ "DF-41 (CSS-X-10; China)". Jane's Strategic Weapon Systems. Jane's Information Group. 2 July 2009. Retrieved 2010-04-06. 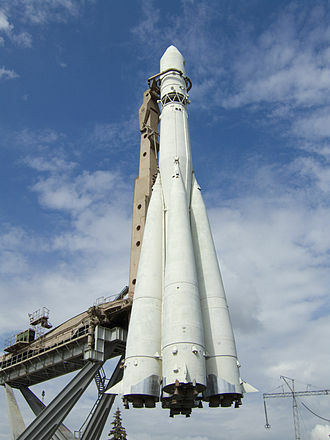 ^ "DF-41 (CSS-X-10)". Missile Threat. Archived from the original on 8 April 2016. Retrieved 2015-01-26. ^ "Agni 5, India's Longest Range Ballistic Missile, Successfully Test-Fired". NDTV.com. Retrieved 2016-02-08. 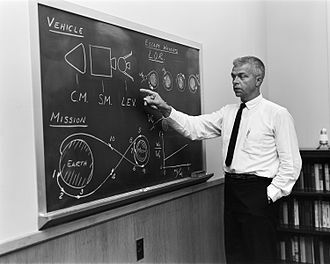 The Titan II was an intercontinental ballistic missile and space launcher developed by the Glenn L. Martin Company from the earlier Titan I missile. 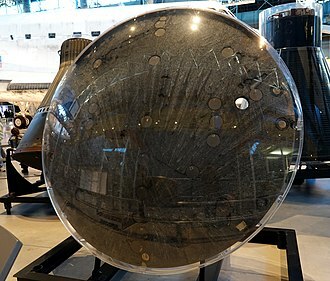 Those payloads included the USAF Defense Meteorological Satellite Program, the NOAA weather satellites, the modified Titan II SLVs were launched from Vandenberg Air Force Base, California up until 2003. 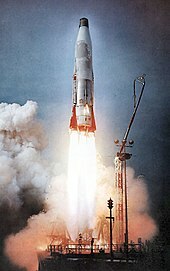 The Titan II ICBM was the successor to the Titan I, unlike the Titan I, it used hydrazine-based hypergolic propellant which was storable and reliably ignited. 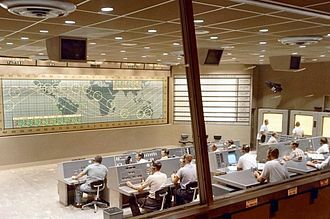 This reduced time to launch and permitted it to be launched from its silo, Titan II carried the largest single warhead of any American ICBM. 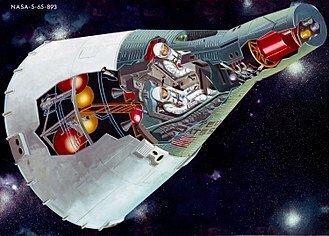 The missile consists of a two-stage, rocket engine powered vehicle, provisions are included for in-flight separation of Stage II from Stage I, and separation of the RV from Stage II. 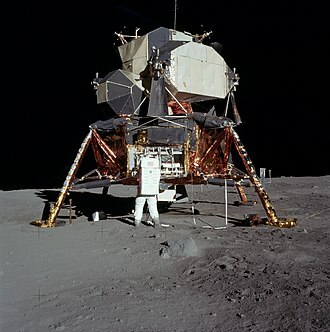 Stage I and Stage II vehicles each contain propellant and pressurization, rocket engine and electrical systems, in addition, Stage II contains the flight control system and missile guidance set. 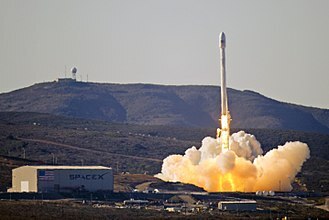 The airframe is a two-stage, aerodynamically stable structure that houses, the missile guidance system enables the shutdown and staging enable relay to initiate Stage I separation. Each stage is 10 feet in diameter and has fuel and oxidizer tanks in tandem, external conduits are attached to the outside surface of the tanks to provide passage for the wire bundles and tubing. Access doors are provided on the forward and between-tanks structure for inspection. A man-hole cover for tank entry is located on the dome of each tank. The Stage I airframe consists of a structure, oxidizer tank forward skirt, oxidizer tank, inter-tank structure. The interstage structure, oxidizer tank forward skirt, and inter-tank structure are all fabricated assemblies utilizing riveted skin, the oxidizer tank is a welded structure consisting of a forward dome, tank barrel, an aft dome and a feedline. 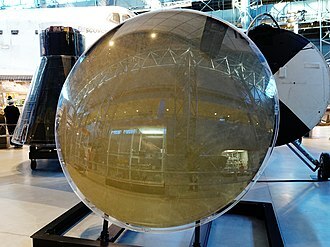 The fuel tank, a structure, consists of a forward dome, tank barrel an aft cone. The Stage II airframe consists of a section, oxidizer tank, inter-tank structure, fuel tank. 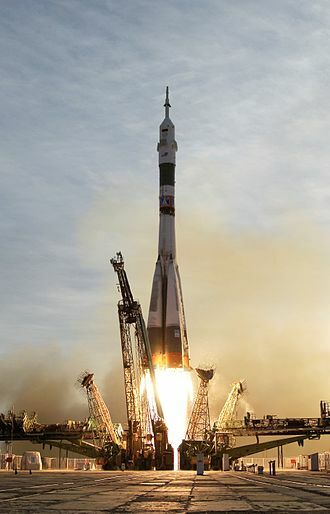 Cosmonautics Day is an anniversary celebrated in Russia and some other former USSR countries on April 12. 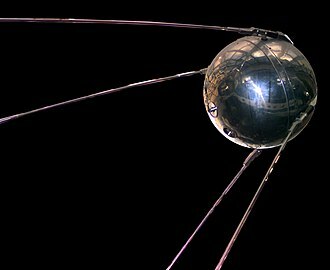 In Poland an International Day of Aviation and Cosmonautics is celebrated on the same day, gagarin circled the Earth for 1 hour and 48 minutes aboard the Vostok 1 spacecraft. 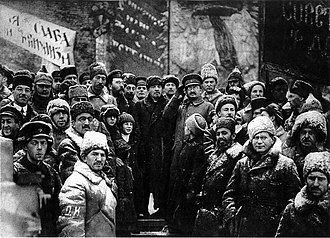 The commemorative day was established in the Soviet Union one year later, in modern Russia, it is celebrated in accordance with Article 1.1 of the Law On the Days of Military Glory and the Commemorative Dates in Russia. 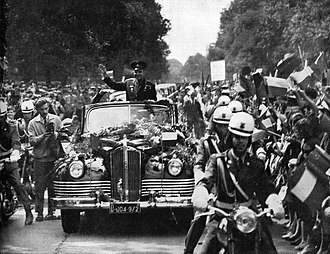 Gagarins flight was a triumph for the Soviet space program, gagarin became a national hero of the Soviet Union and Eastern Bloc and a famous figure around the world. 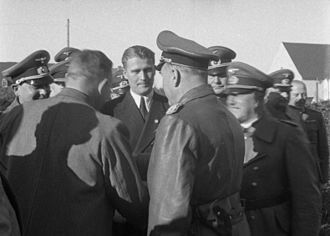 Major newspapers around the globe published his biography and details of his flight and other cities in the USSR held mass demonstrations, the scale of which was second only to World War II Victory Parades. Nowadays the commemoration ceremony on Cosmonautics Day starts in the city of Korolyov, the festivities are concluded with a visit to the Novodevichy Cemetery. 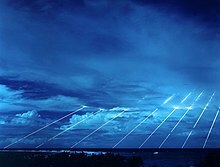 A multiple independently targetable reentry vehicle is a ballistic missile payload containing several warheads, each capable of being aimed to hit one of a group of targets. By contrast a unitary warhead is a single warhead on a single missile, an intermediate case is the multiple reentry vehicle missile which carries several warheads which are dispersed but not individually aimed. 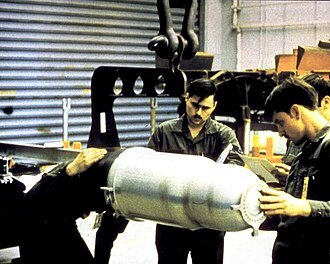 Only the United States, United Kingdom, France, the military purpose of a MIRV is fourfold, Enhance first-strike proficiency for strategic forces. Providing greater target damage for a given thermonuclear weapon payload, several small warheads cause much more target damage area than a single warhead alone. This in turn reduces the number of missiles and launch facilities required for a destruction level - much the same as the purpose of a cluster munition. 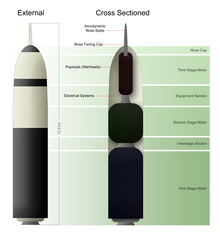 With single warhead missiles, one missile must be launched for each target, by contrast with a MIRV warhead, the post-boost stage can dispense the warheads against multiple targets across a broad area. 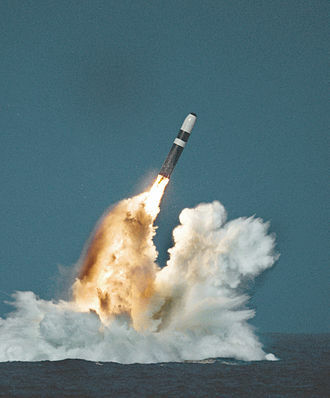 Reduces the effectiveness of a missile system that relies on intercepting individual warheads. 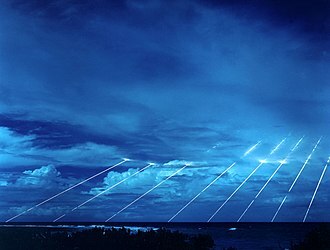 While a MIRV attacking missile can have multiple warheads, interceptors may have only one warhead per missile, decoy reentry vehicles can be used alongside actual warheads to minimize the chances of the actual warheads being intercepted before they reach their targets. A system that destroys the missile earlier in its trajectory is not affected by this but is more difficult, MIRV land-based ICBMs were considered destabilizing because they tended to put a premium on striking first. 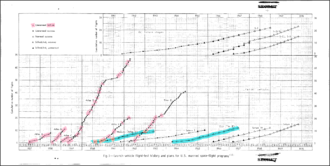 Later on the US feared the Soviets MIRVs because Soviet missiles had a greater throw-weight, for example, the US MIRVs might have increased their warhead per missile count by a factor of 6 while the Soviets increased theirs by a factor of 10. Furthermore, the US had a smaller proportion of its nuclear arsenal in ICBMs than the Soviets. 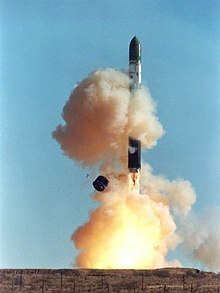 Bombers could not be outfitted with MIRVs so their capacity would not be multiplied, thus the US did not seem to have as much potential for MIRV usage as the Soviets. 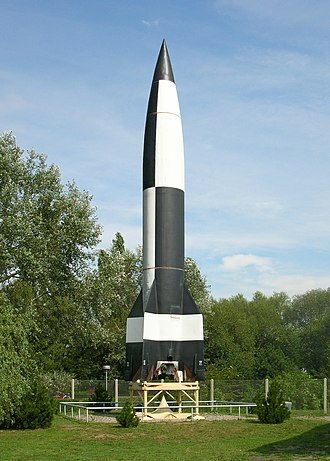 The LGM-118 Peacekeeper, known as the MX missile, was a land-based ICBM deployed by the United States starting in 1986. 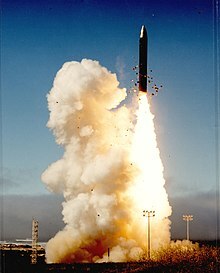 The Peacekeeper was a MIRV missile that could carry up to 10 re-entry vehicles, a total of 50 missiles were deployed starting in 1986, after a long and contentious development program that traced its roots into the 1960s. 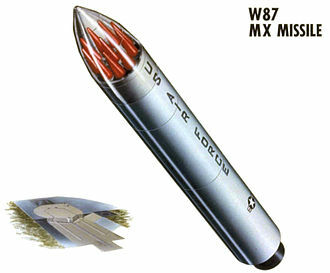 MX was designed to allow the US to ride out an attack by the Soviet ICBM fleet. 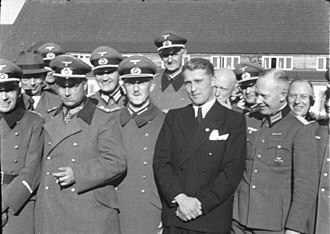 Among these three, the issue remained an unsolved problem and the subject of much criticism during the MXs development. 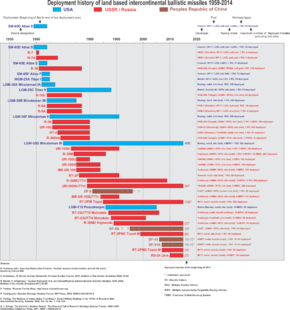 During the same period, the US and USSR were involved in negotiations on the START II treaty, although START II was not ratified by the United States, the missiles were removed anyway, with the last one going out of service on 19 September 2005. Their advanced W87 warheads were slated to be moved to the Minuteman III, the private launch firm Orbital Sciences Corporation has developed the Minotaur IV, a four-stage civilian expendable launch system using old Peacekeeper components. 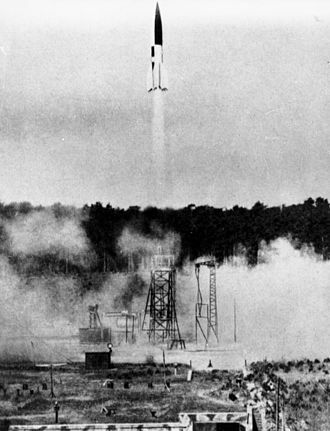 Deployment of the Minuteman ICBM began in 1962, during the Cold War, and proceeded rapidly. 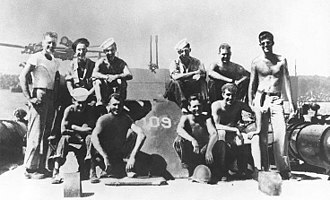 Limited accuracy with a circular error probable of about 0.6 to 0.8 nautical miles and this limited these early models to attacks on strategic targets like cities and ports, and the system had little or no capability as a counterforce weapon. 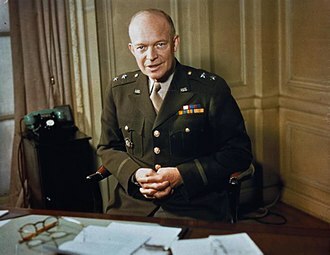 The Air Force relied on its manned bombers as the weapon for attacking hardened targets. He ultimately solved this problem by reducing reliance on the bomber. At the time an attack was all the Soviet could mount. They had just enough of these to make a damaging, but not critical, by April 1964 the US had more ICBMs on active alert than strategic bombers, which exacerbated this concern. 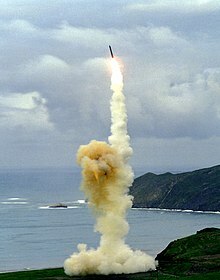 The US ICBM fleet was primarily targeted against cities, and retargeting them took considerable time, in the event of a Soviet missile launch, the US faced the difficult decision of whether to fire their own missiles immediately or wait to determine the targets of the Soviet missiles. 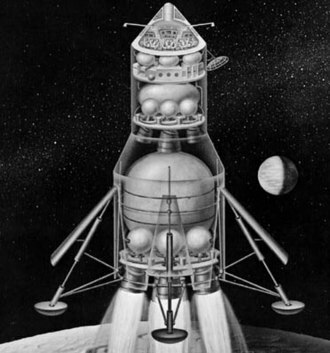 The "Little Boy" and the "Fat Man" devices were large and cumbersome gravity bombs. Cruise missiles have a shorter range than ICBMs. 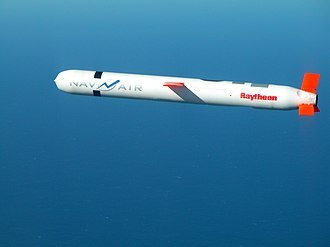 U/RGM-109E Tomahawk pictured (not nuclear capable anymore). The Davy Crockett artillery shell is the smallest known nuclear weapon developed by the US. Mercury–Atlas 9 rocket and spacecraft at Launch Complex 14 at Cape Canaveral, Florida, in 1963. Mk21 re-entry vehicles on a Peacekeeper MIRV bus. 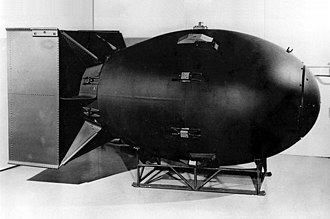 Each carries a 300-kT W87 warhead with about 20 times the power of the bomb dropped on Hiroshima during World War II. Retired Peacekeeper Rail Garrison Car prototype at the USAF National Museum. 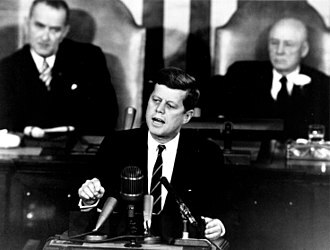 The term ICBM address is derived from the ICBM or intercontinental ballistic missile.